Difficulty concentrating is an issue that often plagues women approaching menopause. During perimenopause, changes in hormone production affect the various parts of the brain that control short-term memory and attention span. This can impact the way the brain processes and absorbs information, causing concentration difficulties as a result. The symptom is characterized by feelings of mental fogginess and distraction. The lack of outward, visible indicators can make concentration problems seem less real or significant but, like other menopause symptoms, difficulty concentrating is an important problem for which there is help available. Explain to those you live with that you are having some issues with concentration, and explain why; use this article as a reference if that helps. Ask for your family's support and help in combating the issue; regularly playing brain-stimulating games together - like cards and board games - will help keep your mind agile and alert. Similarly, learning a new skill is stimulating for the brain and therefore beneficial to concentration. Ask your partner or close friends to take up a new hobby alongside you, such as foreign language lessons or a night class. Ginkgo has been used for centuries as a memory-enhancing herb, and there is some evidence today to support the use of ginkgo extract for this purpose. It is thought that the herb exhibits properties that boost blood circulation to the brain to stimulate the cognitive functions and various neurotransmitters that control short-term memory. 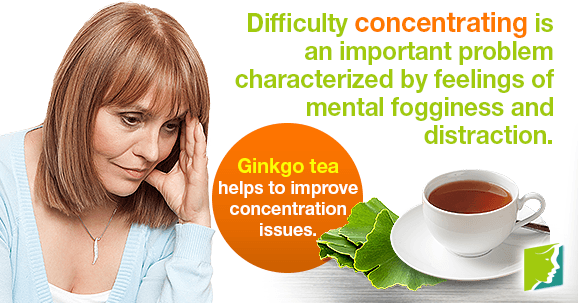 Consuming gingko tea on a regular basis could therefore help improve concentration issues over time. Devoting time and energy to improving your concentration is something that can only be done by one person: you. Adjusting your lifestyle to incorporate more brain-stimulating activities will help improve short-term memory and mental clarity to combat concentration issues. Regular exercise significantly improves mental functioning during menopause. Try to engage in some physical activity - whether this means going for a brisk walk, swimming, taking an aerobics class, or playing tennis with a friend - for at least 30 minutes, five days a week. Downloading a brain-training application on your mobile device could be a fun way to work on your cognitive functions, with the benefit of being conveniently accessible to use whenever you have a free moment. When choosing an app, either ask your doctor for recommendations or search for apps that have been Food and Drug Administration (FDA)-approved to ensure safety, efficiency, and effectiveness. Reading can be done practically anywhere, and it's a great way to engage your brain and sharpen your cognitive functions. Menopausal concentration issues can make reading more of a challenge, so be sure to choose reading material that you're genuinely interested in, read with a pen in hand for underlining to help emphasize key points, and take regular breaks to prevent your mind from wandering. Although talking to a doctor may be emotionally helpful, as of yet there are very few medications for menopausal brain fogs, and it's likely your doctor will recommend habits and lifestyle adjustments for alleviating the symptom. Though concentration issues are a burden during menopause, avoid getting frustrated, as this will not do anything to alleviate the symptom. Channel your energies into combating the problem with adjustments to your lifestyle and habits. Think of concentration as a skill; like other skills, the more you work on it, the stronger it will become. Read about lifestyle changes to improve concentration.